What a splendidly Olympian MNFC we had last night! As if it wasn’t enough that Di and I had been at the Olympic Park that very morning, Adam outdid himself with some Olympic Veggie Lasagne (image attached) served on Union Flag plates, then there was a group effort with edible Olympic rings (image also attached)! I’m not sure that chocolate fingers really qualified as javelins though, by any stretch of the imagination. 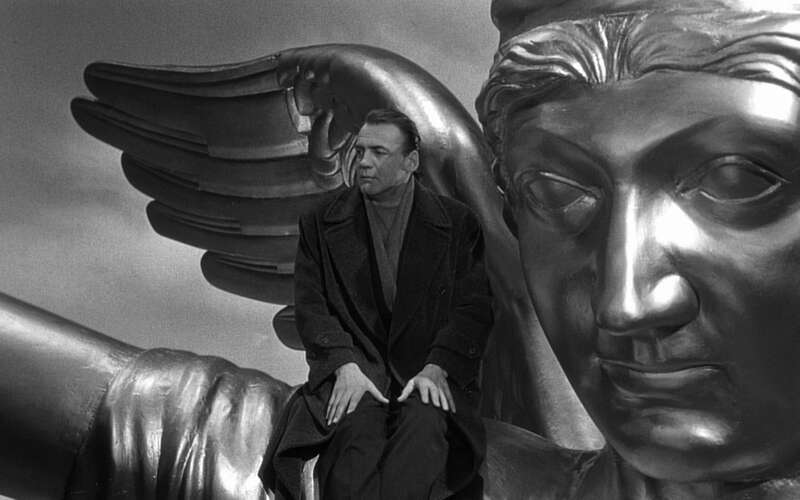 Adam also dragged us back to the world of arthouse and serious chin-stroking by selecting Wim Wenders‘ Wings of Desire as the evening’s film. The film follows two angels, Damiel and Cassiel played by Bruno Ganz and Otto Sander, as they spend their immortal days amongst the people of Berlin listening to people’s thoughts, offering comfort where it is needed, and seeking to “assemble, testify and preserve” reality. This existence is interrupted as Damiel decides he wants to become a human, to experience human sensation, after falling in love with a trapeze artist. Although this love element was taken up by Hollywood and expanded into City of Angels the following decade in the ‘remake’ of the film, in Wender’s original it does not take such a central role. Instead we are taken on a mesmerising, lyrical journey through the mass of humanity that makes up Berlin, almost as if we have fallen into a poem and are able to see its images and hear its music. Wenders is happy to let the inner monologues of the people the angels come across envelop us before slowly moving us towards the focus of Damiel’s desire. The film was heavily inspired by the poetry of Rilke, who used angels as a recurring motif in his work. There is actually a recurring poem in the film, ‘The Song of Childhood‘, which perhaps seeks to capture the purity of feeling that Damiel is seeking in the experiences of living. The experiences of angels and humans are separated on film by absence and presence of colour, something reminiscent of the British film A Matter of Life and Death. For all you trivia hounds, the colour palette for the angels in WOD that was somewhere between black and white and sepia was achieved using an old silk stocking that belonged to the cinematographer’s grandmother! The cinematography took centre stage in throughout the film, with most of the dialogue coming from voice over. Rather surprisingly, a key role in the film was played by none other than Columbo himself, and there was also a cameo from Nick Cave & the Bad Seeds playing live in a Berlin nightclub, which apparently pretty much looks like the hipster hangouts of young Berliners today. The woman that Damiel falls in love with was played by Solveig Dommartin, who performed all the trapeze moves herself having learned them in 8 weeks in preparation for the film! Wenders was part of the group of directors that emerged during the New German Cinema period of film making, alongside Werner Herzog. He went on to produce a sequel to Wings of Desire, and has more recently become well known for his work as a documentary maker on films like Buena Vista Social Club and Pina. Until next time, those of you who would like to read a bit more about the film might like this little essay.